Select a house, townhouse, condo or villa in this small oceanfront community from Satellite Beach vacation rentals. The accommodations are economical and offer spacious, comfortable and quiet beach settings. Pamper the family this year and forget the motels, hotels and cramped quarters; Satellite Beach vacation rentals offer the best overall economical value. Whether you've come to Satellite Beach to winter and visit old friends, that warm weather break with the family or are looking for a central spot from which to tour Florida, you'll find the perfect accommodations at Satellite Beach vacation rentals. 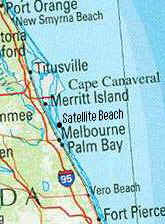 Satellite Beach is directly South of Patrick Air Force Base and the nation's Space Center. The town is a great place to stay for touring the Air Force Base, Kennedy Space Center, the Canaveral National Seashore and Merritt Island National Wildlife Refuge. The Pineda or Eau Gallie Causeway allows for easy access to the mainland and a quick trip to Disney World and the theme parks of central Florida. A drive South on the fabled seaside roadway, A1A, allows you to visit Indialantic, Melbourne Beach and Vero Beach within minutes during a scenic, comfortable drive. There are excellent historical districts located up and down the coast and you'll be in the center from your Satellite Beach vacation rentals.